Your Galaxy Tab’s web-browsing app is named Browser. You can find its icon on the main Home screen or, like all the other apps on the Tab, it’s on the Apps Menu. 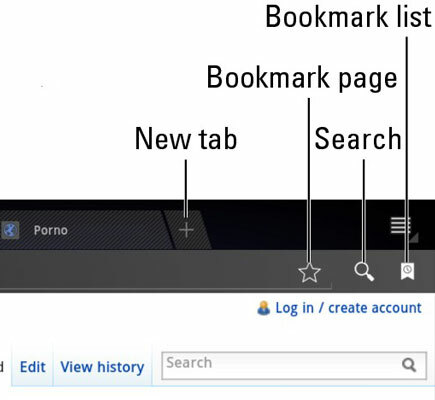 The cinchy way to bookmark a page is to touch the Favorite (star) icon on the right end of the Address bar. Tap that icon, and you see the Bookmark This Page window. You may want to edit the Label to something shorter, especially if the web page’s title is long. Shorter names look better on the Bookmarks window. Touch the OK button and you’ve added the bookmark. After the bookmark is set, it appears in the list of bookmarks. To see the list, touch the Bookmarks button on the Browser app’s main window. You see a list of web page thumbnails with their labels or titles beneath. Swipe the list downward to see more bookmarks and thumbnails. Touch a bookmark to visit that page. You can add a bookmark to the Home screen by touching the Add To menu in the Bookmark This Page window. Choose Home Screen from the menu. Remove a bookmark by long-pressing its entry in the Bookmarks list. Choose the command Delete Bookmark. Touch the OK button to confirm. The bookmark is gone. Bookmarked websites can also be placed on the Home screen: Long-press the bookmark thumbnail and choose the command Add Shortcut to Home. The MyBookmarks app, available at the Android Market, can import your Internet Explorer, Firefox, and Chrome bookmarks from your Windows computer into the Galaxy Tab.